Keith “One Time” Thurman has been a prize-fighter for some 8 1/2 years, but this is his 20th year in the game after taking up the sweet science at age 7 as part of an after-school program. Thurman has plenty for which to be thankful, and he spoke about that this week as he continued preparation for his welterweight title defense against Shawn Porter on June 25 at Barclays Center in Brooklyn (on CBS). Thurman, who is now trained by Dan Birmingham and assistant Chris Getty – Ben Getty’s son – is 26-0 with 22 knockouts. He won the interim title in July 2013 with a 10th-round knockout of Diego Gabriel Chaves in July 2013 and became full champion with a wide unanimous decision over Robert “The Ghost” Guerrero in March 2015; Thurman has made one successful defense. The fight with Guerrero was only the fourth time Thurman had been taken the distance. He takes pride in his knockout ratio of 81 percent. Thurman and Porter (26-1-1, 16 KOs) were to fight in March, but Thurman sustained whiplash in a February car crash and the fight was postponed. When you consider “Sugar” Shane Mosley is 44, he looked good Saturday during his 12-round unaimous-decision loss to David Avanesyan of Russia at Gila River Arena in Glendale, Ariz. The very idea that a man Mosley’s age could give a respectable account of himself against a fighter 17 years his junior, was impressive. But in talking to Mosley a couple of days before the fight, he wasn’t still fighting so he could have people say he looked good for an old man. He said he was still active because of his love for the sport and because he thought he was still good enough to win at the top level. Well, even though Avanesyan came in with an interim welterweight title, he did not come into the fight with an impressive list of opponents and he had never fought in the U.S. As the interim champion, he is in line to face the June 25 winner of the fight between full champion Keith Thurman and Shawn Porter. Avanesyan would seem to have little change against either man. The point is, if Mosley can’t beat Avanesyan, he should hang up his gloves once and for all. Mosley has had a great career. He will be in the International Boxing Hall of Fame. It’s been a great ride. Keith “One Time” Thurman retained his welterweight world title with a unanimous decision over Robert “The Ghost” Guerrero (32-3-1) in the main Saturday night at MGM Grand in Las Vegas (on NBC). Thurman decked Guerrero in the ninth round, but Guerrero showed tremendous toughness by giving Thurman plenty of grief over the final three rounds, bringing roars from the crowd. Thurman (25-0) won by scores of 120-107, 118-109 and 118-108. Both battered fighters went to a local hospital for precautionary measures, according to the broadcast team on NBC. Golden Boy Promotions has announced it will play host to a Showtime tripleheader to be contested April 26 at StubHub Center in Carson. The main event will feature Keith “One Time” Thurman defending his interim welterweight title against Julio Diaz. Also, Omar Figueroa will defend his lightweight title against Jerry Belmontes. And John Molina of Covina will take on former junior welterweight champion Lucas Matthysse in a 10-round fight. Molina (27-3, 22 KOs) and Matthysse (34-3, 32 KOs) have 54 knockouts between them, so that figures to be a fight that does not go the distance. “I am excited to showcase myself against someone that I consider to be one of the best fighters in the world at 140 pounds,” said Molina, who has campaigned mostly as a lightweight. He is a graduate of Charter Oak High. Keith “One Time” Thurman on Saturday will defend his interim welterweight title against Jesus Soto Karass (28-8-3, 18 KOs) of Mexico on the undercard of the welterweight title fight between champion Adrien Broner and Marcos Maidana at the Alamodome in San Antonio (on Showtime). Thurman (21-0, 19 KOs), of Clearwater, Fla. was recently asked about previously calling out Paulie Malignaggi while Malignaggi was still champion, or before he lost his title to the aforementioned Broner this past June in Brooklyn. Indeed, a fight between Broner and Thurman would be highly anticipated. Broner is well established and about as cocky as they come. Thurman is a legitimate world-class fighter who would give just about any welterweight in the world a run for his money on a given night. 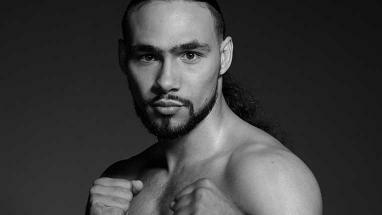 If you have yet to catch the work of Keith “One Time” Thurman, you’ll get another chance on July 27 when the heavy-handed welterweight takes on another hard-hitter in Diego Gabriel Chaves of Argentina in an interim title fight at AT & T Center in San Antonio (on Showtime). Thurman is 20-0 with 18 knockouts. His moniker speaks for itself. He has nine first-round knockouts, eight of them coming consecutively at the outset of his career. After voicing his appreciation for this fight, Chaves (22-0, 18 KOs) became patriotic.